Wow. Folks, every now and again here at the Candy Gurus, Scotty, Matty & myself come across what we call a “spitter”. As we huddle together, eagerly ripping open new bags of candy we’ve never tried, we usually find that we’re either somewhat disapointed, or somewhat impressed. Occasionally, we discover a new gem, an instant classic, and every now and again…we find a spitter. A candy SO revolting, so without any redeeming value that we can’t even swallow one piece. People, I LOVE candy. So when I say I can’t swallow one piece, it means STAY AWAY. 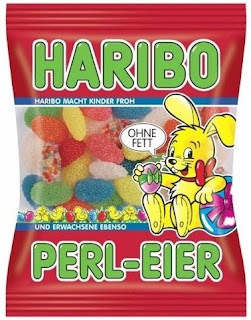 These small “pearl eggs” are soft (way too soft) gelatin centered confections covered in disgustingly sweet “pearl” balls. From the look of the bag, you can tell these are made for kids (and it WAS in fact my son who threw these in my already overstuffed shopping basket without me knowing. Thanks, Hank, that’ll be docked from your allowance if I ever give you one). When you pick from the many eerily bright eggs, the first thing you notice when you bite down is the lack of any sort of consistency. Immediately after, the overwhelming bland sweetness takes over, and then….well, ….that’s when I spit it out. I’m sorry folks, I try to stick it out for you, but sometimes I simply can’t. There’s just too much good candy in the world to waste any time eating the crappy stuff. This accidental bag made it to our tasting. I was the first to taste. So bad I nearly spit but I really wanted Jon to taste it. There is no shame in running from a spitter and I felt that Jon was a potential speedster. So I swallowed – maybe some of it whole. Matty made it through after two near hucks but with some seriously sour faces.I have to say that I love Haribo and I’m not gonna run from a brand that has produced some true treats but who the heck let this one slip through inspection. Wanna know where jelly is good? One place. Peanut butter sandwiches. Oh and I remember my dad once got some pepper jelly from one of his patients for the holidays and my mom made me eat some with cream cheese on Wheat Thins and Ok that wasn’t bad. But it’s not like I’m going out and looking for pepper jelly. Jonny’s Bottom Line: It doesn’t really get any worse than this. Yes, a Zero theoretically would be worse, but I’m saving that for a candy that actually induces vomiting.Scott’s Bottom Line: If you ain’t a kid, skip it or risk spitting. so, like ‘bo raspberries but different flavors? Not at all. The raspberries are dense, crunchy and tasty. These are foul, mushy, gross.